This post is sponsored by Henry's Humdingers but all opinions are my own. An 11 year old boy named Henry sat down on a plane next to a beekeeper who told him about Colony Collapse Disorder. Henry became so concerned about helping to save the bees that he asked his mom for a hive... pretty soon the Miller family had so much honey they started adding spices to it, so they could make sauces, marinades and spreads with it. The spiced honeys were so good: Henry's Humdinger's was born. Henry is now 17 years old and with the help of his parents, he is getting his products into stores around the country. Henry even earned a spot on the show Shark Tank. The investment didn't work out, but it helped the company's exposure. Henry still needs to pay back his parent's investment of their retirement fund, and help them save their family's farm. 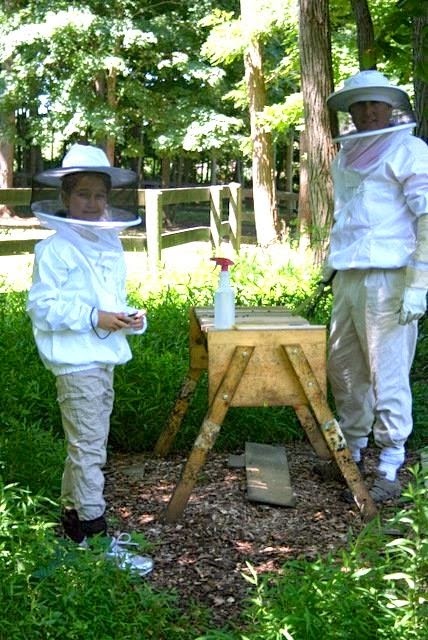 My daughter and husband with our bees. My family are beekeepers and my son Henry is only a few year's younger than Henry Miller. 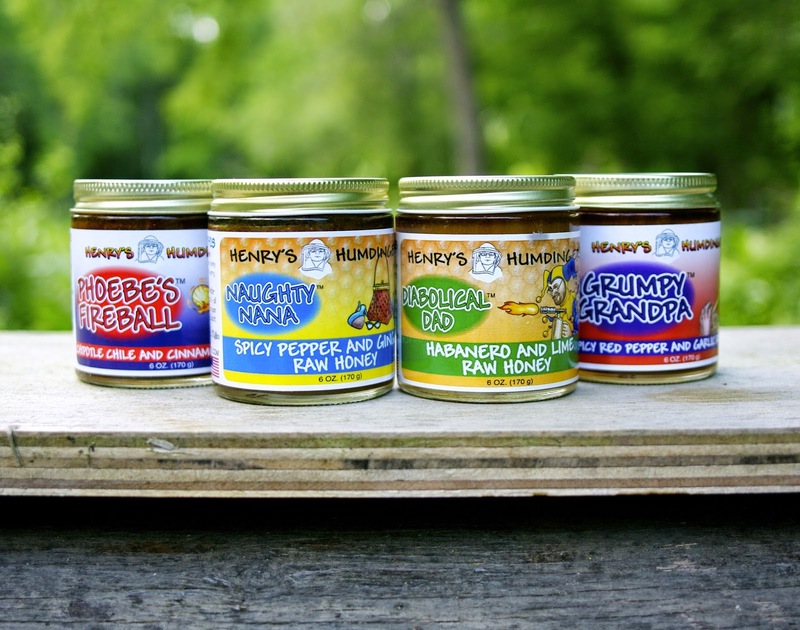 We are so impressed with Henry's commitment to helping to save the bees, and the exceptional taste of his products, that I had to let you know about Henry's Humdingers. Now there are four amazing flavors with fun family stories connected to each one: Grumpy Grandpa's Spicy Red Pepper and Garlic, Diabolical Dad's Habanero and Lime, Phoebe's Fireball Chipotle Chile and Cinnamon and Naughty Nana's Spicy Pepper and Ginger Raw Honey. Henry is offering a Special Father's Day package which includes different baseball caps. This is a great product to give a dad who likes spicy food, and it is perfect for this time of year, because these honey's are terrific for grilling and making Mexican and Southwest style foods for the summer. Henry has put together a list of recipes that his family has developed using their product: Henry's Humdingers Recipes. 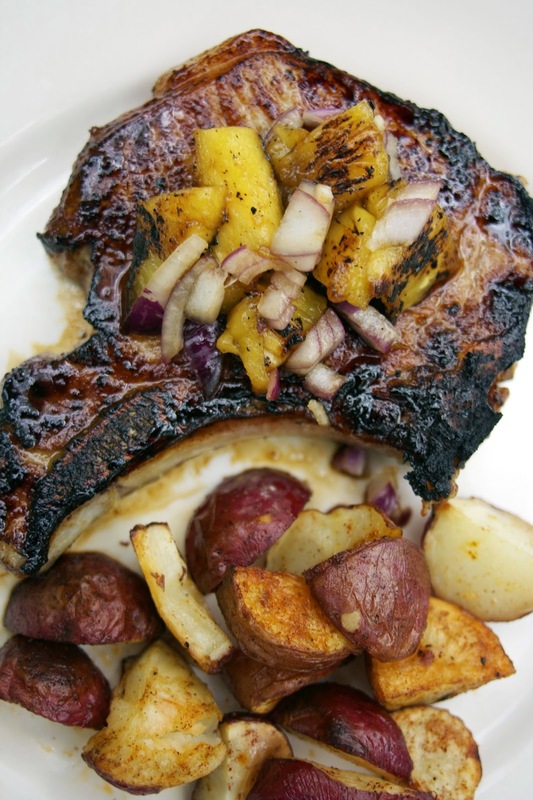 I would like to add this Pineapple Honey Pork Chop to that list, and wish Henry Miller all the best with his product. Buy some honey from Henry you'll be supporting a budding entrepreneur and helping to save the bees! LIKE Henry's Humdinger's on Facebook and Twitter too. 1) One hour before cooking the pork chops brine them in a salt/sugar mixture. Here is a link for a basic brine. This is very important to do in order to ensure tenderness. 2) While the pork chops are brining, cut your pineapple into slices. You can used pre-cut pieces or jarred. Large slices are best because they are easier to grill or braise in a skillet. 3) Chop up your onion and put it in a medium size bowl. 4) Whisk the honey and soy sauce together. If it is not thin enough to spread with a basting brush add a little more soy sauce. 5) Get your grill or a cast iron skillet hot. 6) Grill or cook on the skillet (without oil) the pineapple slices about 2 minutes per side or until they get a little black. When they cool down chop them up and put them in the bowl with the red onions, mix. 7) If you are using a skillet to cook the pork chops add about 1 tablespoon of vegetable oil to it on medium high heat. 8) Brush the pork chops with the honey glaze and grill or skillet cook for about 3 minutes per side...depending on thickness. Thick pork chops work best on the grill. The internal temperature should read about 145. 7) Heat up the remainder of the honey glaze until it just boils and add it to the pineapples and red honey. Add the lime juice and a pinch of salt. 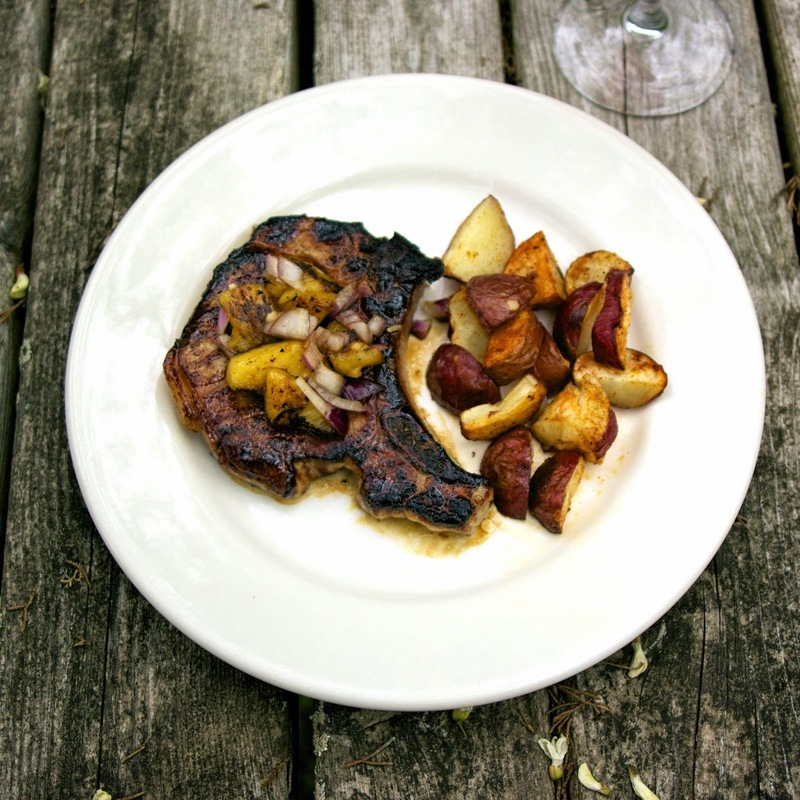 Mix and serve over the pork chops. 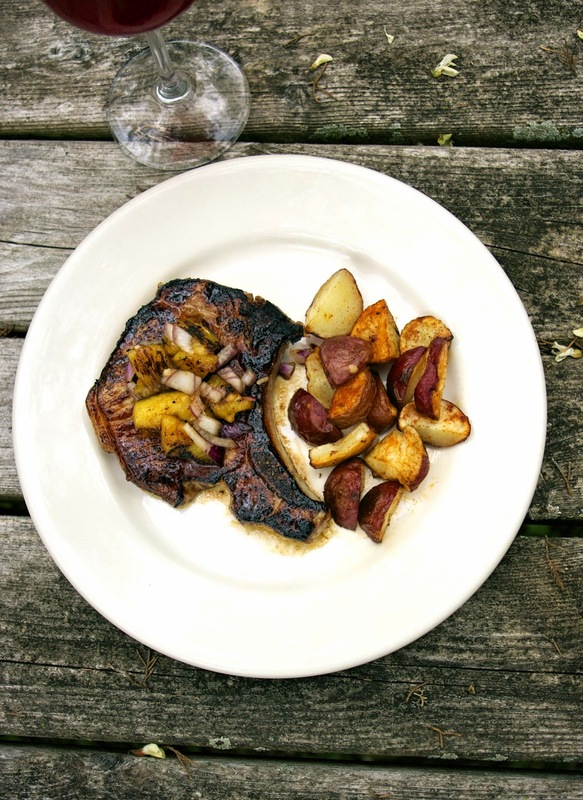 Some grilled corn or roasted potatoes works well with this dish. *NOTE: If you truly can't get some Henry's Humdingers you can mix some honey with some chile peppers and ginger to make the glaze. These look delicious! 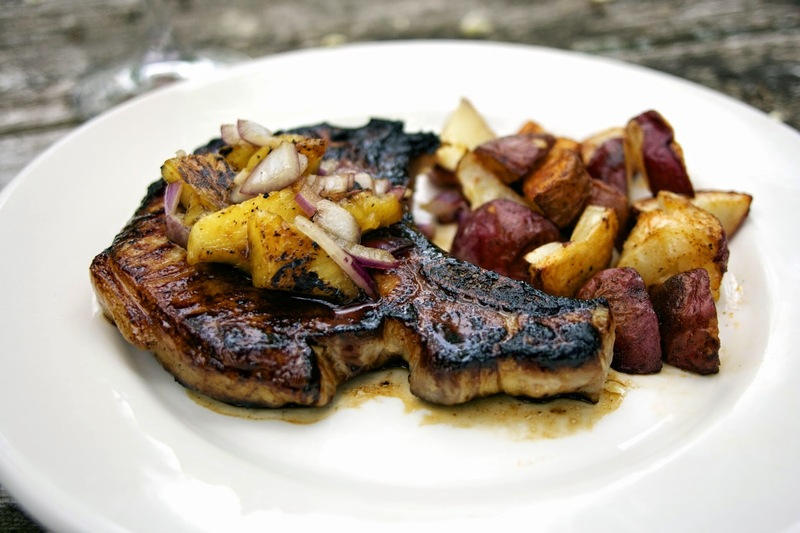 I never thought to add pineapple to my pork chops. Ill have to try it soon! Pork is one of the few meats that I really like fruit with. In the Fall try apples...delicious. I love hearing about kids taking an initiative like this. Thanks for sharing Diane. The pork and pineapple sounds delicious with the honey. Isn't it wonderful to see such a young man care so much about something? I just can't get over Henry's maturity. I would've never paired these ingredients together, but it sounds delicious and I'll definitely have to give it a try!! Thank you so much for linking up at Tasty Tuesday! Your recipe has been pinned to the Tasty Tuesday Pinterest board! Please join us again this week! I'm very new to cooking with fruit but I am loving it, especially in warm weather it's great. I so enjoyed reading about Henry Miller and his passion to save bees. Over the years, I've seen fewer and fewer bees in my garden and my crops suffer because of it. 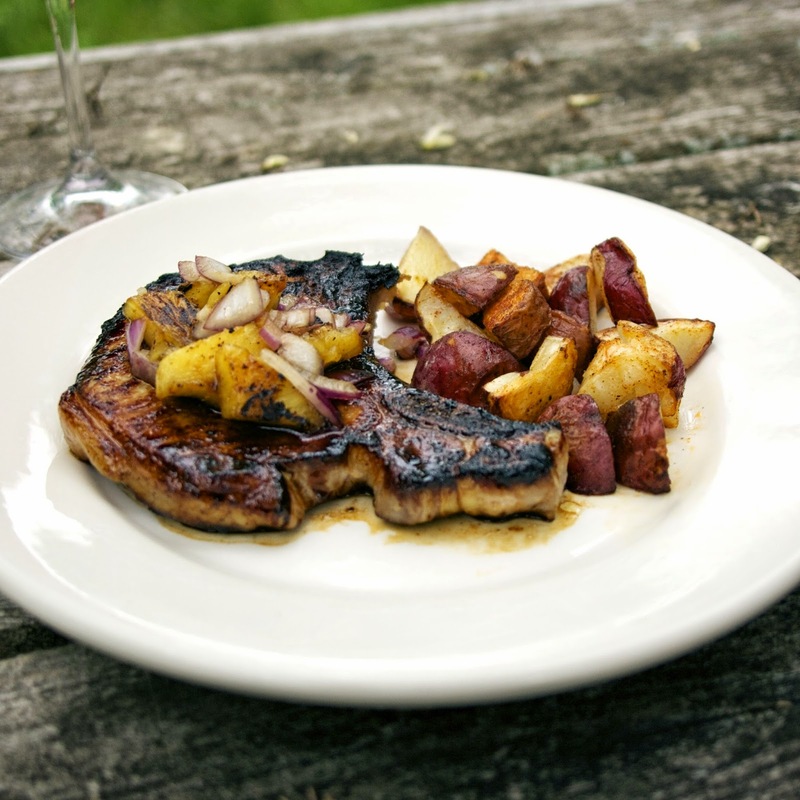 Cooking with fruit is something that is new to me too, but these pork chops look like a nice, light summery dish. Thank you for sharing, Diane. I know I walk in a meadow that used to be covered with honey bees in the Spring and now I see so few. It is really frightening.